I love my husband. He’s my best friend in the world and he always finds cool things for me from other parts of the web that I don’t frequent. If I had my druthers I’d look at pictures of pink balloons, frothy dresses, hand-made letterpress cards, patterns of dogs, t-shirts with animals and mustaches on them, and revamped dressers all day. Thanks to him I learned about Wordle. It’s so much fun. You can enter a website and it will find the most frequently used words and make a word cloud out of them. Then you can change the fonts, the shape of the cloud, and the colors. I love my Maquette word clouds. 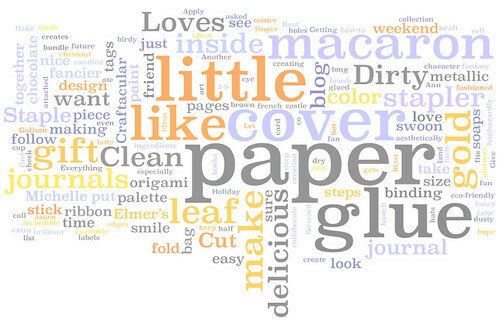 It was not shocking to learn that “macaron”, “paper”, and “loves” were popular words on my blog. If you have a blog you should try it, or enter the url of your favorite blog and see what kind of cloud you come up with. Oh Dave is so great! I will check this out–sounds fun, thanks! do it!!! Let me know what your big words are. Mine are “Swoon” and “Macaron”….so great.